The inaugural Oaktown Music Festival aims to prop up the East Bay music scene through an online contest and weekend of performances exclusively featuring local artists. Cortt Dunlap and Sarah Sexton. During Oakland's First Fridays street festival in August, Sarah Sexton's phone was buzzing with texts from friends excited to see posters advertising her next big project, the Oaktown Music Festival. However, the messages were alarming to her. Sexton, who owns the entertainment production company Oaktown Indie Mayhem, had handed out some fliers but had not yet created any posters. She soon learned that another event with a similar name and identical initialism was being promoted at the same time. "At first I was like, 'What the hell kind of irony is this?'" Sexton said of the Oakland Music Festival, an event in Uptown that featured more than twenty (mostly) local acts across two stages on September 21. "Great minds think alike?" 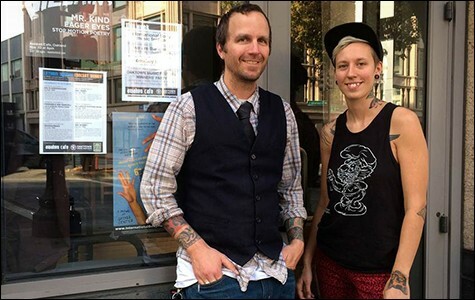 was the response of Cortt Dunlap, the owner of Awaken Café, who is coordinating the Oaktown Music Festival with Sexton. "I wish we had picked more divergent names," he said. "But it'll all come out in the wash."
The simultaneous inception of the two projects does, however, speak to the message both event organizers are promoting: Oakland has a thriving music scene that's worthy of a festival. Still, the approaches of the two OMFs — whose organizers each plan to make them annual events— are quite different. While the Oakland Music Festival in September was more of a traditional music fest, with an outdoor stage at 19th Street and San Pablo Avenue and an indoor one at The New Parish, the Oaktown Music Festival is, for now, primarily an online project, a battle-of-the-bands-style competition exclusively for Oakland bands and musicians. In early September, Oaktown Indie Mayhem and Awaken Café began soliciting nominations for the best song and music video categories. Fantasy Recording Studios in Berkeley donated a free full-day recording session to the best-in-show winner, which helped drum up interest in the project. Festival organizers ultimately received more than 2,200 submissions representing more than 250 bands and artists. Nominees were required to be from Oakland — meaning they cite Oakland as their hometown or have members who reside in the city – and had to be independent (not signed to a major label). A group of judges, including representatives from Pandora, OM Records, and NPR's Snap Judgment (as well as former Express music editor and current contributor Whitney Phaneuf), voted on finalists and eventually selected honorable mentions, runners-up, and winners: Bells Atlas won best song by a band (for "Kazoo"), Art Elliot won best song by a solo artist (for "Earth Abides"), The Seshen scored best music video (for "2000 Seasons"), and Lila Rose snagged best in show (for the highest jury score across all categories). The winners will perform at Awaken Café this weekend. "There's always been so much focus on ... the San Francisco music scene, and that's really shifting," Sexton said. "Oakland is becoming really famous for its art and music scene, and I think there's that sense of pride." Oakland, she added, is a place where musicians don't feel as much pressure to conform to popular trends and styles. "It's a bit more genuine. It's more raw." Dunlap said the festival aligns with the sustainability philosophy of buying local that has been central to his cafe. "We've really got to appreciate the quality of the talent in Oakland." 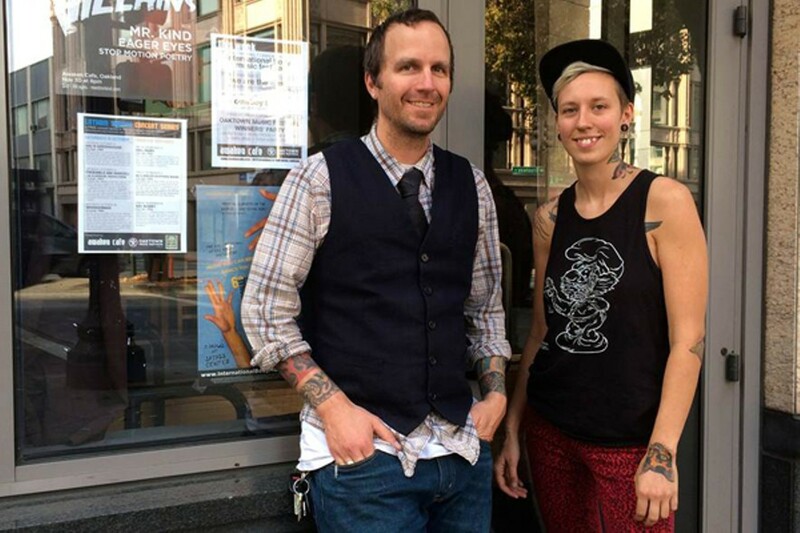 There's also the reality that many artists and musicians are moving across the bay for cheaper rents, a migration that included Lyz Luke, a festival juror who's the executive producer of the Bay Area music coalition UnderCover Presents. Luke said she made the move from San Francisco to Oakland in July because so many of her collaborators now live and play shows in Oakland — a fact that required her to regularly commute. "One by one, they are starting to move out to the East Bay," she said. "That's where the Bay Area music community is going to be, if they're not already there." The festival aims to capitalize on that momentum while reflecting the diversity of the talent in Oakland. "A lot of people were worried about it only being white hipster bands," said Luke, noting that the range of submissions turned out to be quite broad. Sexton said she expects some will criticize the fact that none of the winners are hip-hop artists, but pointed out that the finalists covered a wide spectrum of genres. Alfonso Dominguez, co-founder of the Oakland Music Festival, said he plans to expand his event next year, as do Oaktown's organizers. These kinds of festivals, he said, help to push back against the constant negative press the city receives. "There is a need to communicate that it's not just a food-and-bar scene. It's a cultural scene," Dominguez said. "Oakland's always had it." The inaugural Oakland Music Festival boasts two stages and more than twenty mostly local acts.